L’Éclair de Génie | the (fake) parisienne. I don’t know what genius momentum is behind this movement but more and more specialty stores are making their mark around town. These shops create only one type of product but they do it really really well. I’ve seen confiture shops and thé shops and choux à la crème shops and there seems no end to what may come next. 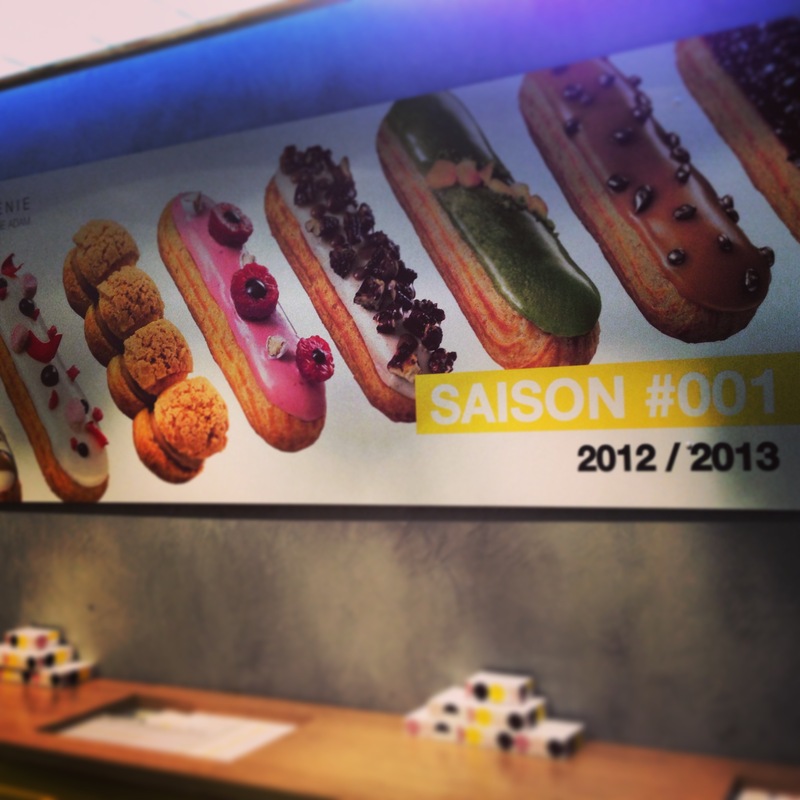 I first discovered this modernistic little éclair shop while walking through the Marais. L’Éclair de Génie is surprising in many ways. Its minimalistic design, bright pop of colors and white-washed walls are a refreshing change from the typical Parisian pâtisseries decked out in ornate gold detailing, pale pastels and elaborate displays, thereby elevating this sophisticated dessert to a younger, funkier status. Mind you, I adore the ultra-Parisian, ornately-decorated pâtisseries because they evoke whimsy and the grandeur of all things French but change is nice sometimes! 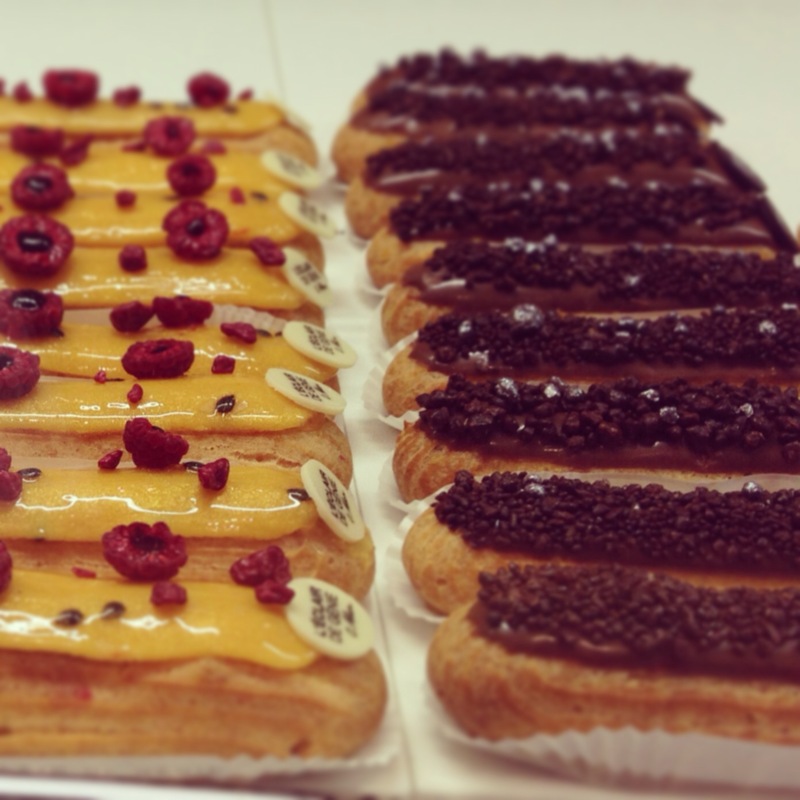 Let me confess right now that I have had a love affair with le éclair for as long as I can remember. 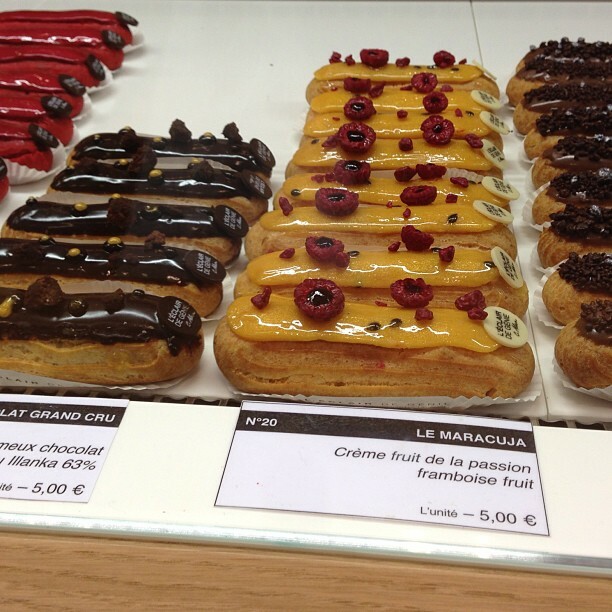 I LOVE éclairs! I mean really really love them! If you ask me, the best way to eat an éclair is slightly chilled. I love them when they’ve been left in the fridge for about an hour because they are just delicious. The cream becomes just a teeny bit more solid, is deliciously cool and contrasts beautifully against the unique texture of the eclair dough giving it more bite. If ever given the choice among French desserts, it’s invariably always an indecisive tie between an éclair and a tarte au citron. Given my recent obsession with being more healthy (a bit tough in France but I’m trying!) I have not had one of these babies in a while now. Instead, I get my éclair fix by taking visitors to try it and get immense pleasure from watching them oooh and aah over the choices and drool as they bite into its fleshy insides. You would think I were showing off my own shop as I deliver my now well-rehearsed marketing pitch. What I love about this concept is that it not only conceptualizes and creates its delicacies as works of art but treats them as such. There is a huge wall panel behind the counter that reads saison #001 as if it were a seasonal collection from a défilés de mode. They have so many flavors and they all look so scrumptious, its truly difficult to choose. I’m typically quite traditional in that I adore just basic chocolate but I was feeling a bit more adventurous (back when I first tried it many months ago) I had the green one you see which is Iranian pistachio and orange. Yum. I take my sugar fixes very seriously because there’s nothing more disappointing than having a bad ‘sweet’ experience so I am now contemplating which glossy confection I will try the next time I decide to drop my diet for a yummylicious experience. They sell for 5 Euro a piece – not cheap – but worth the indulgence. 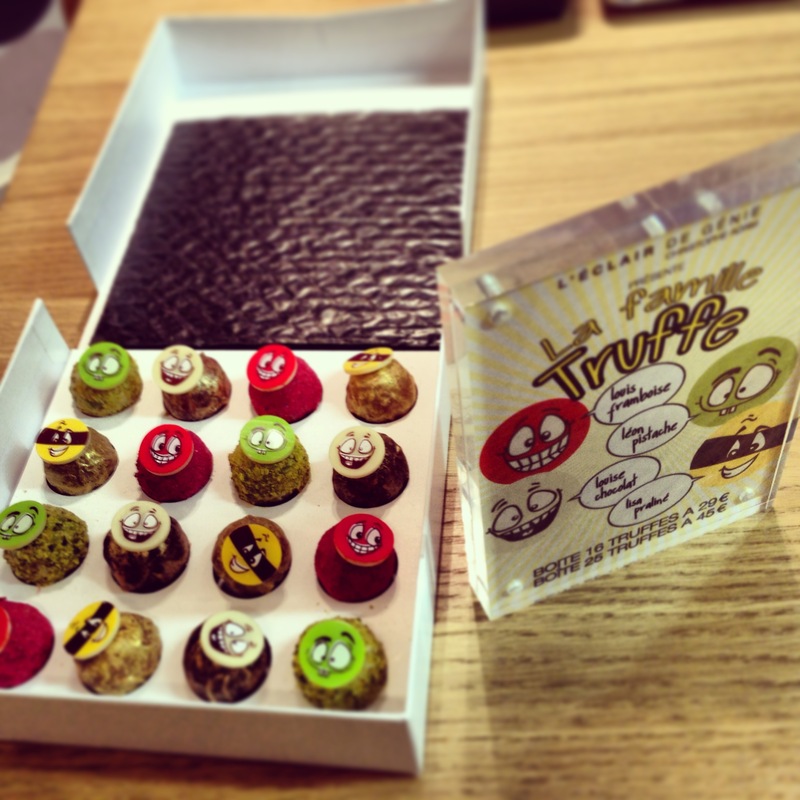 And as you go to pay at the cashier you will be greeted by some cheeky little truffles with funny faces that scream “eat me!”. Oh dear famille la truffe, I would just devour you whole if I had the chance. Go try it! There are now two branches in Paris. 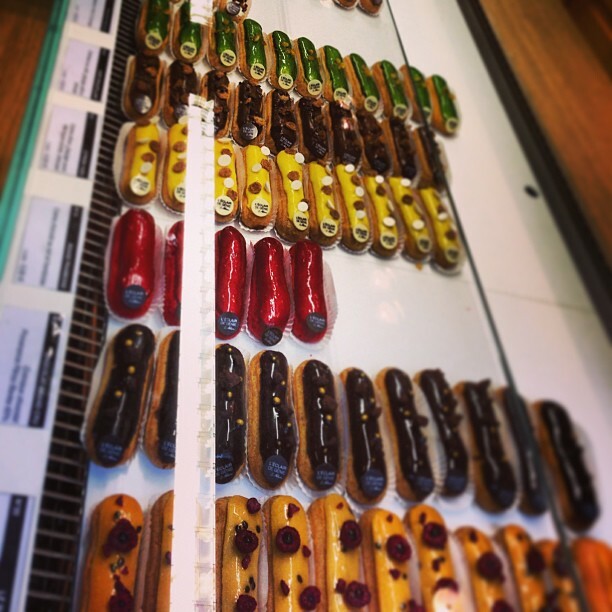 To dive even further into this fabulous monde of éclairs, click here. Seriously wanted to eat my computer screen, that’s how tasty these pictures looked. 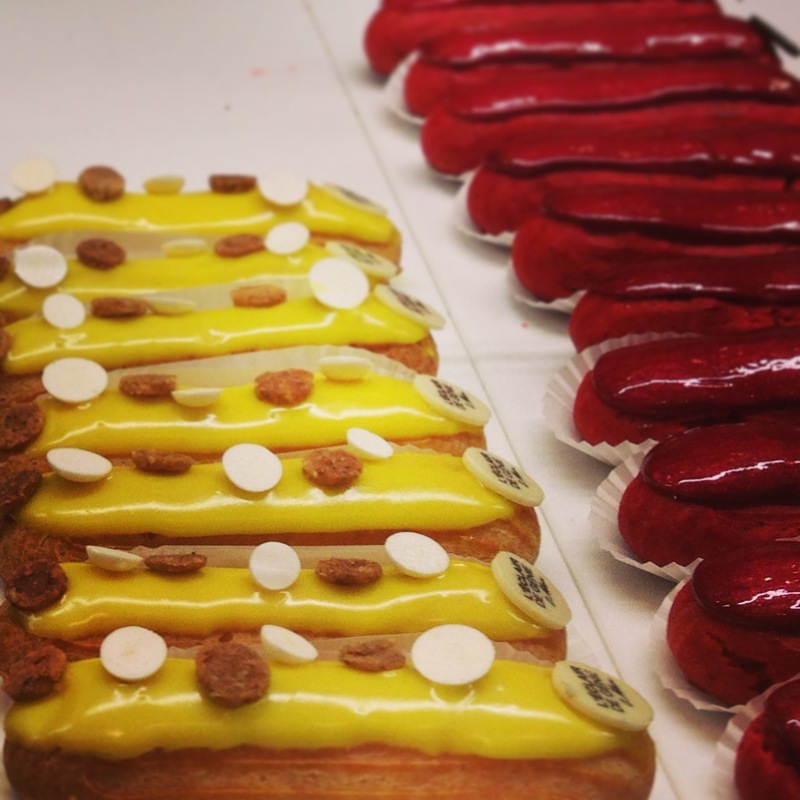 Here’s hoping NYC gets some specialty eclair shops… I am so over cupcakes. Agree about the cupcake craze! And definitely add this little gem to your list of must-do’s for your next visit to Paris!